A Great Asset for Año Nuevo! 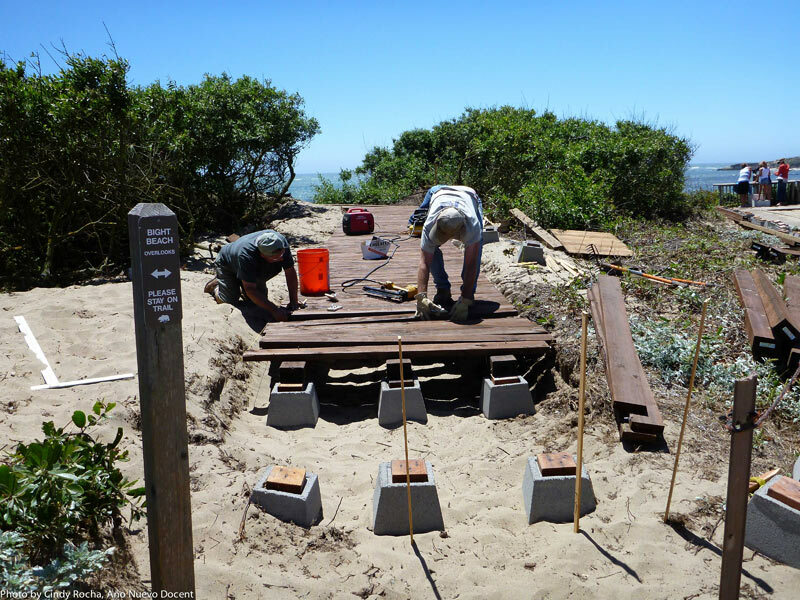 In the spring of 2013, State Park Rangers Ziad Bawarshi and Terry Kiser asked CSPA for assistance in the renovation of the existing Equal Access Boardwalk at Año Nuevo State Park. Already a high-caliber team was ready and eager to get started. Volunteers had been recruited, a realistic timeline was proposed, and a modest budget was presented for Coastside State Parks to use to secure donations. The new boardwalk had been fully designed and permitted. 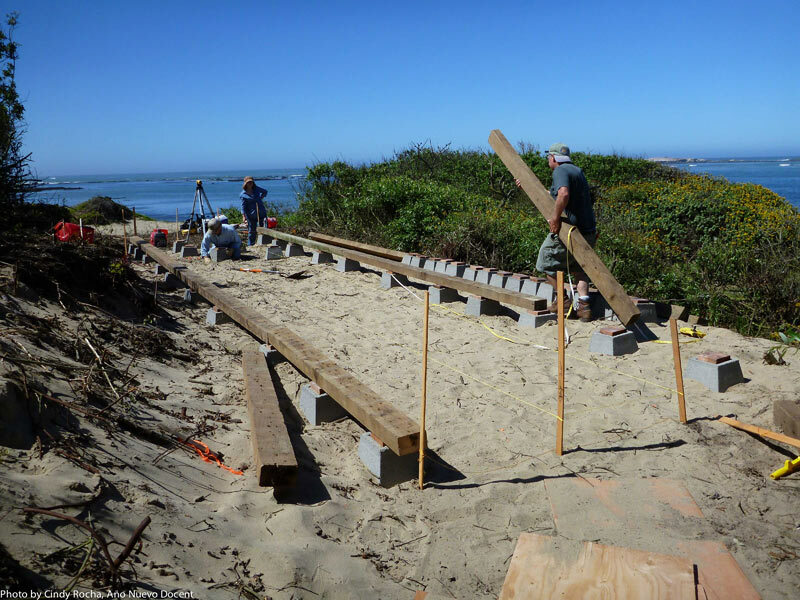 The boardwalk plans and specifications would better accommodate the site ecology and behavior of the elephant seals. 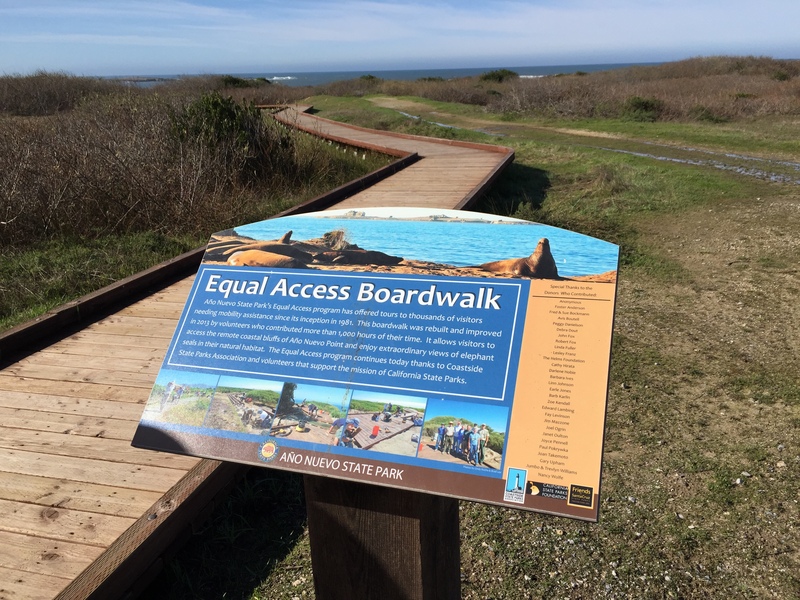 But equally important, it complied with the Americans with Disability Act and California State Parks Accessibility Guidelines. The new boardwalk would be new and improved. The path of travel was widened from four to six feet to accommodate two visitors traveling abreast. 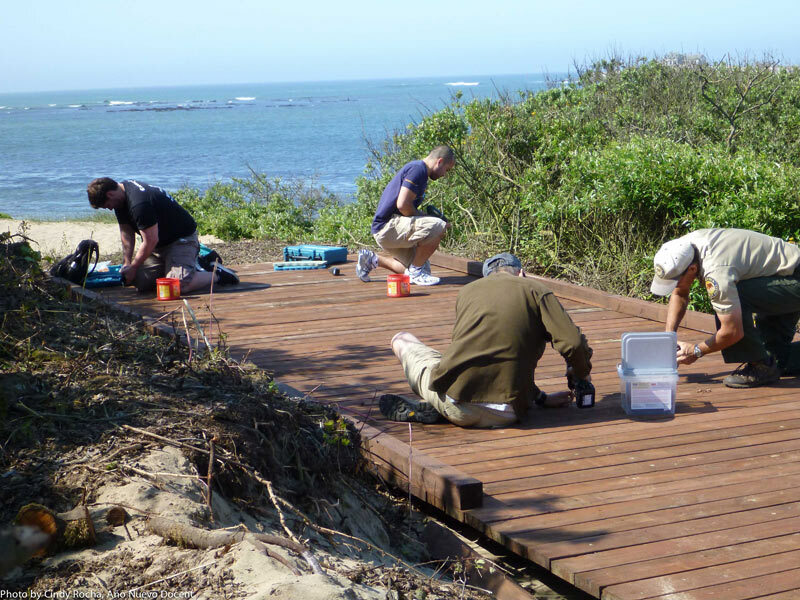 The boardwalk was rebuilt along a 1300 linear foot course with a choice of two overlooks, which assist in seal viewing near Bight Beach and allow visitors to avoid seals who might be on the boardwalk. 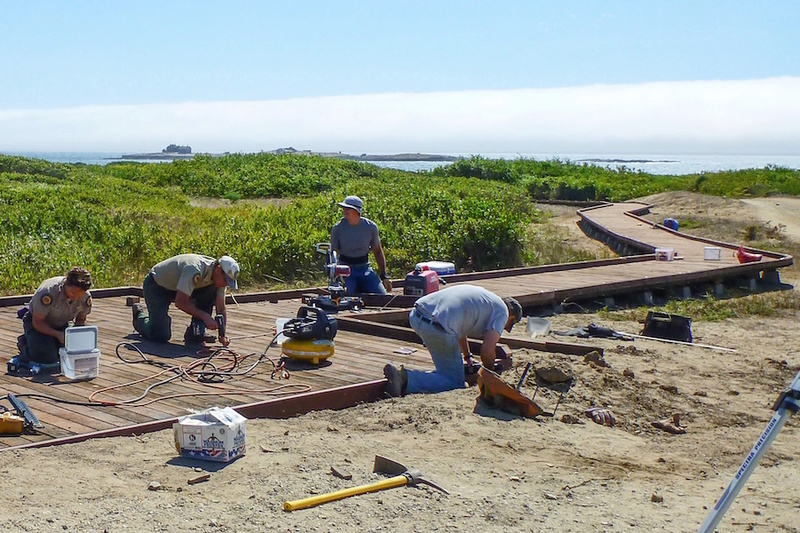 A 22’ x 16’ unloading deck and a 10’ x 40’ viewing deck were rebuilt, as well, as a mid-way pullout along the boardwalk. It is a work of art, showing fine workmanship as the boardwalk curves along its route. Benches at the trailhead, mid-way pullout, and overlooks have well-designed legs, giving the boardwalk a distinguished look. CSPA was pleased to support this project for many reasons. Several years ago, we supported the Equal Access Program through the purchase of a shuttle van that brings visitors from the main parking lot to the equal access trailhead. 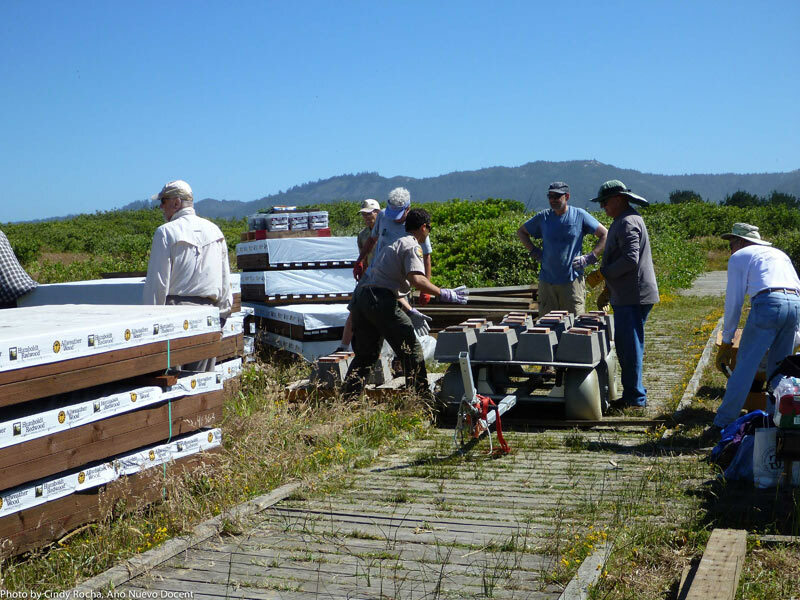 This new project was also an opportunity for CSPA to work directly with State Park volunteers, meet new community partners, and connect our existing donors to another docent program. We at CSPA are thrilled with how the pieces fell into place so smoothly. Jim Mazzone, State Park “Volunteer Extraordinaire,” and a very committed corps of other volunteer boardwalk builders worked every weekend for about two months. They demolished the existing boardwalk section by section and salvaged boards whenever possible to be used for other park projects. They rebuilt the boardwalk, even adding a second overlook at the terminus. To expand the Equal Access Program, CSPA has underwritten the purchase of some additional materials to support docent interpretation. A new spotting scope, four pairs of binoculars, rain coats, an assisted listening system for those with hearing impairment, and handheld interpretive materials such as marine mammal bones, skulls, etc. have been purchased.